Accelerated Mobile Pages accelerate the loading of pages on mobile browser. When I say, “accelerate”, I don’t mean just quick. I mean real quick, too fast! AMP is an open source, universally accessible framework for faster loading internet pages. It is a mobile-only feature. Why do you need to know about AMP? Smartphone is a standard these days. Did you know 80% of internet users own a smartphone? If they own it, they must be using it too. If your work revolves around the internet, mobile audience is important to you. Anything on internet largely depends on its content. As mentioned by Bill Gates “Content is King”. Now if content is King, User Experience is the Queen. We decide what we want to put on the internet. We design it. It’s content. Then we define it’s structure by putting links, images, distribution of pages, etc. for structure. Then comes the styling part. This is to make our content attractive. Then for improving interactivity, we can put variations with images and how they are displayed. And, finally internet delivers our content to users from wherever on the servers it is stored. These stages may seem like a chain, one after the other. 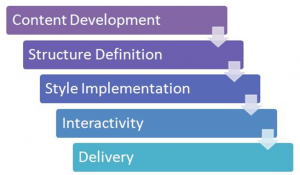 But in reality, the ways these stages are implemented are all intertwined. These all depend on each other. Each process has the ability to affect the other stages. If you have tried to reap benefits of ever growing internet, you sure have tried many techniques and tactics to make people stick to your website. You must have put efforts for providing top level experience to users. You could have opted for responsive themes or optimized all images on your page. You could also have embedded all the Js in one file (as suggested by many). Sometimes, things don’t work out as per our expectations. It may seem quite unbelievable but almost 40% of users leave the website if it takes more than 3 seconds to load. Just 3 seconds! Moreover, 60% of these left audience will probably never even visit again. If that isn’t inconsiderate, then what is! Considering growing market of smartphone users, Google came up with a one-stop solution of Google AMP in May 2015. It is a game changer for everyone out there. It aims at improving user experience by loading pages faster. If you follow AMP standards, your page is displayed above blue links at the top. Less annoyed users might pay more attention to popping ads. So, it’s a win-win for all! Google and Twitter rolled out their joint venture of Google Amp in 2015. AMP works on specified standards and Google’s AMP Cache to deliver content quickly. So, what exactly are these standards? It uses Stripped down diet form of HTML. Meaning it restricts use of some tags and introduces some AMP HTML Tags. It only allows streamlined version of CSS. AMP provides you with a Content Delivery Network that has its own Cache for faster and instant loading. For using AMP, you need to create a copy of your website or pages you want to be AMPed. This copy is then stored in AMP cache with all other AMP pages. This saves the loading time because there is this single place from where the stuff is being loaded. Many platforms like WordPress have special plugins for generating AMP pages of your website. FireAMP app on Shopify does a similar job. Once you install this app, you can opt for generating AMP pages for all the products on your store. This enables easy loading of all the product pages. After that, if buyer heads to buy product you will be redirected to the store and the data will be fetched accordingly. How does all this make AMP faster? The coding restrictions of AMP serve the purpose of loading important content before ads. Also in AMP HTML, you need to specify size of each image so that browser knows beforehand what it has to load. This makes way for a highly improved user experience. One thing worth noting is that AMP standards let you be very flexible and open to content quality. Of all the stages discussed in the beginning of this article, Content Development is the only stage that is not standardized or restricted by AMP. This motivates the premium quality content on the internet. One added feature of AMP pages is that, when you open an AMP link it opens like a popup as you can see in the image below. When you pay attention at the url, you will see it is starting with https://www.google.co.in/amp-<something>. This means that the page is coming from google’s server and what you are looking at is AMP copy of that page. How can AMP help with Search Engine Optimization (SEO)? Pages load faster. When pages load faster, people stay. When people stay, search engines know it and rank your website better. When you have made an AMP copy of your website pages, Google automatically lets them to be displayed above blue links, in the beginning in Carousel. If your article is already at the top, more people are bound to visit. 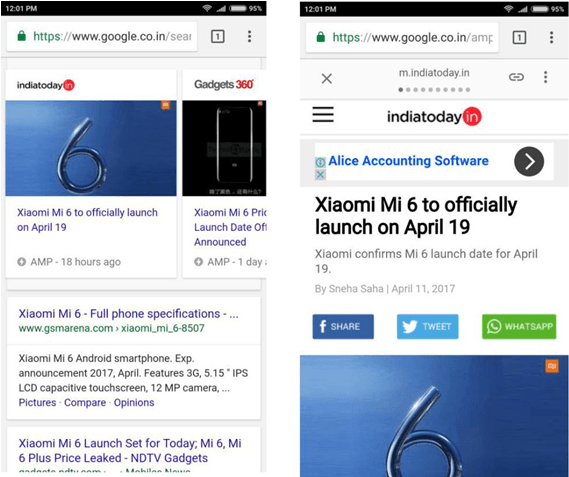 Many publishers and developers have been implementing AMP pages. Stats in following infographic display the success rate of this remarkable venture. It may not be the only solution for browsing optimization. You still need to publish mobile responsive sites and need to follow all the other ways out there. However, AMP sure stands up to its name of a faster mobile internet. 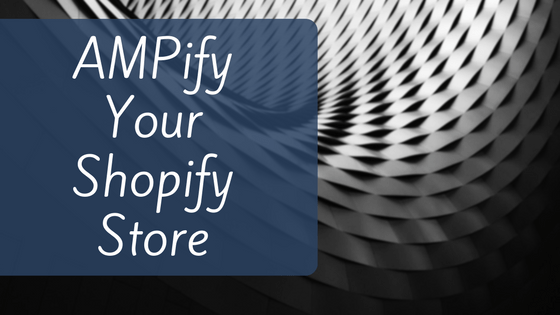 If you are a Shopify store owner and want AMP for all your pages, download our app from here for free! Happy Selling!